All photos within this site are not to be copied without express written consent. The Smith Manure Spreader Company of Chicago began operations in 1890 by its founder Frank Smith. Their first piece of farm machinery was the “Great Western” endless apron manure spreader. Their solid oak design was unusual for the times in that the front axle could be turned much tighter without tipping. They expanded their equipment line in late 1904 to offer cream separators and renamed their company Smith Manufacturing Company. They soon added 2 cycle gasoline engines and litter carriers. Litter carriers carried barn manure in a small metal tub supported by a track hanging from the barn ceiling. These carriers could more easily and quickly remove animal waste outside of the barn than a man with a pitchfork and a wheelbarrow. The Smith Mfg. Co combined all four of these farm equipment pieces and marketed them collectively as the “Great Western” line. The company held many patents for their equipment. The distinctive oval brass tag for the cream separator, which lists the patent numbers covering both USA as well as Canada, lists dates from 1905 and 1906. Many of these brass tags have survived not being sold as scrap during WWII, unlike the remainder of the heavy metal casted cream separator. They sometimes show up in antique stores as mementoes of the past. I think the Smith Mfg. Co was very clever in regards to their marketing; they produced a multitude of full color lithographed promotional items throughout their years of production. One piece that stands out is a full color tin lithographed sign which very vividly highlights the four main pieces that made up their “Great Western” line in action. They also produced oversized brochures, which included great full color lithographs. These distinctive advertisement pieces have become highly collectable for their exceptional graphics by a wide range of collectors. The Smith Mfg. Co. used Jacob Haish’s factory in De Kalb, Illinois to produce the “Great Western” line. Jacob Haish, my 3rd Great Uncle, was a successful entrepreneur and most famous for inventing a form of barbed wire recognized as the “S Barb”. Jacob had a manufacturing campus which produced many farm related implements. He was the sole manufacturer of the “Great Western” line for the Smith Mfg. Co and had separate buildings to produce all four items of the “Great Western” line. The Rock Island Plow Company of Rock Island, Illinois bought the exclusive rights to the “Great Western” line from the Smith Mfg. Co. on October 1, 1911. Haish would still manufacture the line after 1911 for the Rock Island Plow Co, but Smith Manufacturing Company faded into history. 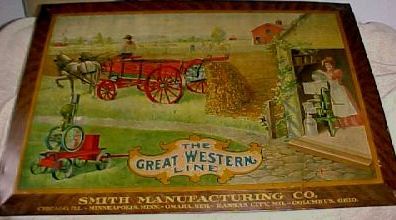 “Great Western” items that show up now with reference to the Smith Mfg. Co are much more rare then items marketed after the 1911 Rock Island Plow Co’s take over. It is interesting to note that a smaller farm equipment company like Smith Mfg. sold at least 50,000 manure spreaders and 70,000 creams separators based on serial numbers before selling out their equipment line. That breaks down to only seven years or less of cream separators sold by the Smith Mfg Co.